UPDATE: the housing has been released, under the Sea Frogs brand, and I’ve used it with a variety of lenses and camera bodies, read more about it here. Meikon, my favourite Chinese water housing manufacturer, have dropped a bit of a bombshell for the surf water housing market today. The new Meikon surf housing looks like it could be the perfect option for amateur surf photographers on a budget. Dear Sony a6000/6300/6500 family fans, at this moment we are working on new underwater housing which will be presented in December. We have been patient and listened to many of your comments in regards to what it should be. Here are some of the key aspects of it: It will have interchangeable port system, viewfinder, new locking mechanism, pistol grip with trigger (for all the surfers out there), dry dome port (especially for 10-18mm lens) and with this port you can use most of E-mount lenses including wide angle and fisheye.The price will start at 277 USD. At this point we are not sure which color it should be, so we will do a leap of faith and ask you guys – What primary color it should be? Black, Yellow, White or ? That sounds like a pretty compelling piece of kit for anyone getting into surf photography. I’m going to be ordering one as soon as they’re available to put it to the test in the waves. I’m interested to see how the port system holds up and how they’re going to deal with the pistol grip connector. I’m hoping they use a threaded port system, but judging by the ports available on their site for their other housings, it looks like a bayonet system where you push it in and twist to secure it in place. 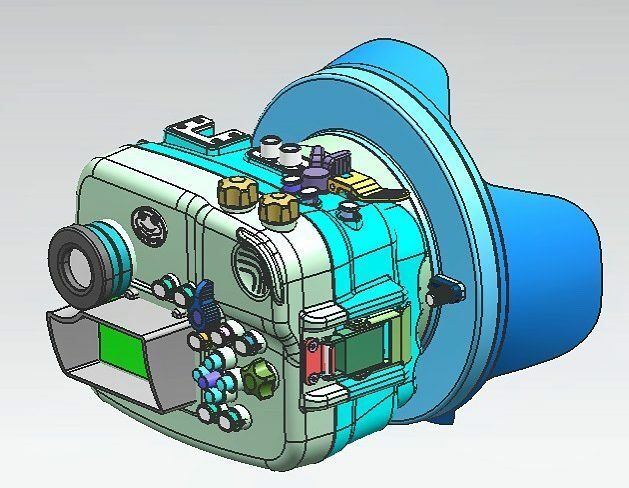 I don’t think that would be an issue, I’m pretty sure the Essex water housings used a bayonet mount for the ports, but nearly everyone else uses a threaded port system for surf housings. 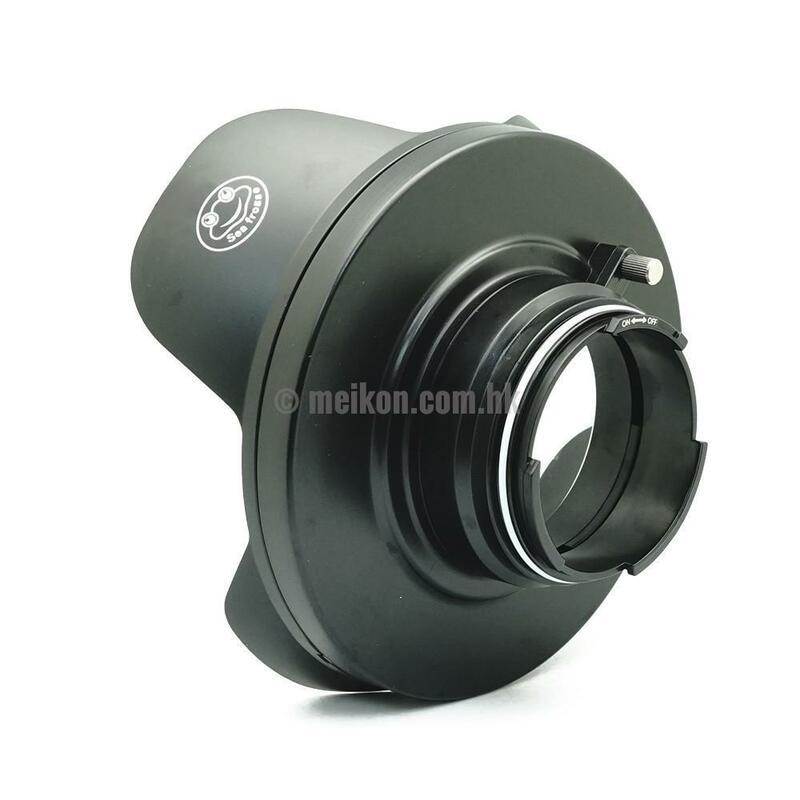 The port has a sturdy (no play) bayonet mount to MEIKON housing and additionally fixed lock inside the housing. So it sounds like you lock the port in place inside before putting the camera inside. It would make sense that they use the existing ports they have available for their mirrorless systems, if that’s the case then you can expect to pay $199 US for a dome port. There’s also a substantial hood on the dome port in the render, this is common for dive housing dome ports, it helps protect the port from getting scratched, but they’re never found on surf housings. I really hope they allow it to be removed easily, if not you can expect to see a tutorial video on how to cut it off appearing on this site soon after I receive it. They sell a neoprene dome port cover for $28.99 US as well, if you want to keep the port protected. The Sony 10-18mm lens is about 64mm long apparently, which is very similar to the Samyang 8mm fisheye V2 and the 7Artisans 7.5mm fisheye, but a bit longer than the Samyang 8mm V1 and the Meike 6.5mm circular fisheye. I’m hoping they’ll all work in the dome port, but I’m prepared to not be able to use the shorter fisheyes in this housing. There’s no mention of other lens ports for the system, but I’d be surprised if there wasn’t a standard flat port for the 16-50mm kit lens available when the housing launches, and possibly a longer flat port too for bigger prime lenses. The one thing that isn’t pictured at all in the render is the pistol grip. There are no clues as to how they’re going to enable the shutter release button on the grip to release the shutter. As I’m sure they’ll be selling this without the pistol grip I doubt whether they’ll be putting a hole in the bottom of the housing to allow a cable through, like SPL and Salty housings. I doubt they’ll use a magnetic switch system like the ingenious design of the Liquid Eye pistol grip, and I don’t think they’ll go for the physical lever around the front of the housing to use the shutter button like my DIY design. What they have used in the past on their other housings is a bulkhead (a waterproof electronic connector) for attaching a flash. If they put a waterproof connector on the housing they could use the same system as Aquatech ans Nimar on their sports housings – having a wire on the inside attach to the camera, then a wire on the outside attach to a waterproof button, and joining the two with a waterproof connector. my guess would be a bulkhead on the side or front of the housing and a separate waterproof button that attaches to the grip and bulkhead. This would mean the pistol grip could cost quite a lot. I don’t think they’ll produce them in the same quantities as the housing as not many people overall would want one, and they’d have to use fairly expensive cables, switches and connectors to make a reliable pistol grip. I wouldn’t be surprised to see the pistol grip as an optional extra for $150 US+. There’s always the unthinkable possibility that it will just be a screw-on handle without any shutter release switch. That would be terrible news and would kill the housing for surf photography, so let’s keep our fingers crossed. I’d want the housing, a dome port, at least one flat port, and the pistol grip personally. So it might not work out to be that much less expensive than something like the Liquid Eye C6000, which comes in at $950 for a housing, dome, flat port and pistol grip, and has the advantage of being a respected surf housing brand that’s proven in the heaviest waves around the world. Let’s wait and see what it looks like. You can be sure that I’ll be getting one to compare with the other Sony a6000 water housings that I’ve used so far, so sign up to the learningsurfphotography newsletter and I’ll let you know when I get my hands on it! The big problem with the meikon I find is that the buttons get stuck. Hopefully this new model will have better design. I also have the a6000 and rx100 and i find the rx100 way better as the zoom and autofocus works really well. I’ve not had that issue – do you use it in a sandy shorebreak? When I’ve had issues like that in the past with housings I find waving them back and forth underwater in a bucket of fresh water clears out most of the sand from the buttons and prevents them sticking. I usually shoot at reefs where there’s nothing to clog up the buttons. I imagine the RX100 would be great for the right type of shot, nice and small and good performance. It would be a great direct replacement for shooting with my Sony a6000 and 18-105 f4. Unfortunately if I want one camera that can get that kind of shot, as well as shooting from the beach and with a fisheye, then I need interchangeable lenses. The a6000 is cheap and you can get budget friendly lenses that do all of those things almost as well as the RX100, then upgrade to better lenses to improve performance where necessary. I have had this issue over time, sometimes sand gets in there and you need to rinse it upside down will pressing the button to help loosen it up. Mine definitely isnt as responsive as when I first purchased it. That’s a good tip, thanks Chris. Hi Michael. Have you tried the Sony 35mm f1.8? 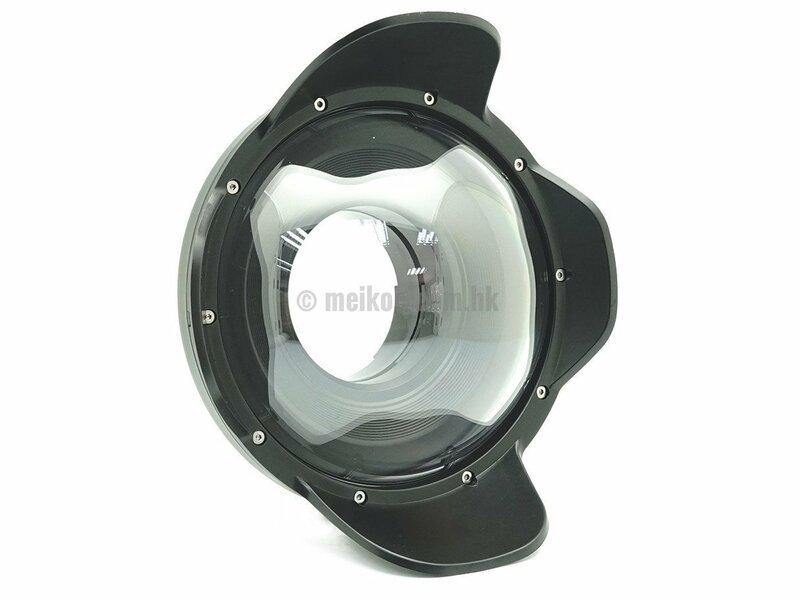 The new housing should offer many more options once they release a longer lens port for it, opening up faster and wider lenses. It does seem like there’s some design challenges that need to be overcome to make a good product for surfers. The viewfinder seems like an easy and obvious addition. I don’t know why you’d need the lcd hood with that there though? I haven’t seen their port system in person, so I’m most interested to see how that compares to Liquid Eye, Aquatech and Salty systems which all seem great for surfing and easy to use. I can’t see it being any better, and like anything new it’ll take a while to trust it in surf. The pistol grip is the other unknown, it needs to be rock solid to compete with the surf housings I’ve used. Looking forward to seeing how it stacks up. they have actually redesigned the old housing already with a universal fit for the A6000/6300/6500 so I imagine the new design will be a variation of this. It’s going to be interesting to see what they come out with. I am not sure how much of a hindrance the hoods will be apart from being a little pokey and maybe running water back onto the dome? I think one of the most annoying hints would be how the water drains off the dome as you move it through the water, but I expect that’s only an issue in small waves or for over/under shots. I expect to se more turbulence from the hood than a bare dome. The other issue is just transporting it around, the lens hood adds a fair bit of bulk to a mirror less housing setup. I’ll definitely cut it off if I can’t remove it another way.